French soap and hand cream Gift Sets by Pre de Provence | P.C. Fallon Co. Treat someone special - maybe yourself! - to authentic and aromatic French soaps, lotions and creams. These are the ultimate "grab and go" gifts as they are already packaged in attractive packages or boxes. All soaps are made in France using pure, natural vegetable-based ingredients including Olive Oil, Shea Butter or Coconut Butter. Order several to have on hand whenever you need a delightful gift to present to someone special. All products are made in France. 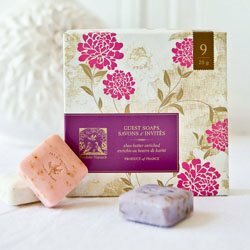 Guest soap collections are an ideal way to sample several Pre de Provence fragrances. Pick up several to have on hand for teacher gifts, hostess gifts, birthday gifts, and other special occasions!